Like a hero from a kung fu story, Sun Yunyi seeks to help the needy every day, out of a sense of justice. 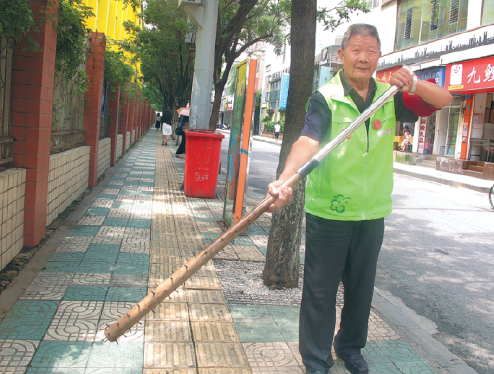 Carrying a 1.5-meter-long self-made spiked club, he has caught more than 6,000 thieves in the past 42 years. Sun displays his self-made spiked club, which he uses to frighten thieves. In addition to running a key-cutting store in Kunming, capital of Yunnan province, Sun, 75, has dedicated more than half his life to catching thieves. He is only 1.65 meters tall and of medium build. However, Sun's kung fu ability sets him aside from other men his age. A typical day for Sun begins with half an hour of exercise before opening his store at 7 am. At midday, he walks around the marketplace near his store on the lookout for thieves. He said his personal record is catching 43 thieves in a day and eight at one time. When talking about catching thieves, Sun appears full of passion, gesticulating wildly. "The modus operandi is different depending on the type of thieves I am catching. I can tell by their behavior if they are up to no good, and I have never made a wrong judgment," Sun said. Sun's belly, chest, feet and legs have many scars caused by knives or clubs used by thieves. To prevent his family from worrying, Sun sets rules for himself to ensure his safety, carries his spiked club while patrolling the neighborhood, and keeps a first-aid kit at his store. In 1975, while Sun was working as a cook in a hospital canteen, he caught a staff member stealing cooking oil from the canteen three times. Sun claims he was framed and lost his job after being accused of stealing the oil. "Ever since then, I have hated thieves from the bottom of my heart," Sun said. He has provided local police authorities with nine notebooks recording detailed information about the thieves he has caught and the crimes they committed. "My dream is to catch a total of 10,000 thieves. But now I am getting older and weaker, so it is harder to achieve that goal," Sun said. Like a hero from a kung fu story, Sun Yunyi seeks to help the needy every day, out of a sense of justice.